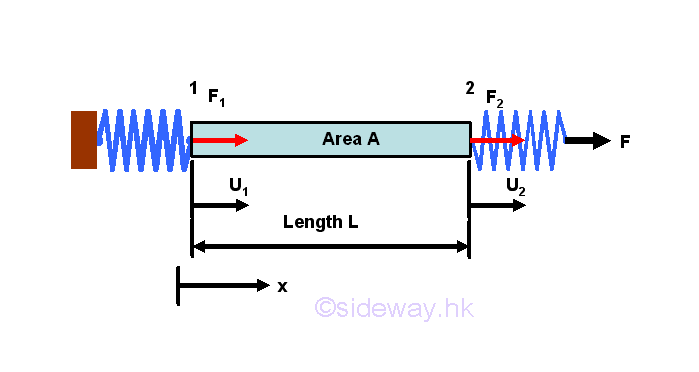 One dimensional linear element can be used to analysis structural pin jointed problems. 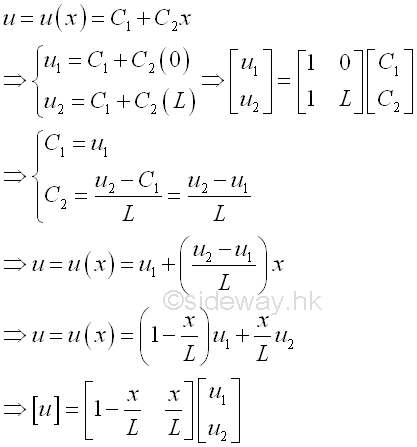 Subsitute equations of stress and strain into the stress-strain relationships of the bar, and a force-deformation relationship expressed in terms of force and displacement is obtained. When considering the bar as an individual object, forces, F1 and F2 at both ends of the bar can be expressed analytically as following by assuming a fixed end opposite to the interested force with one consistent coordinate system. 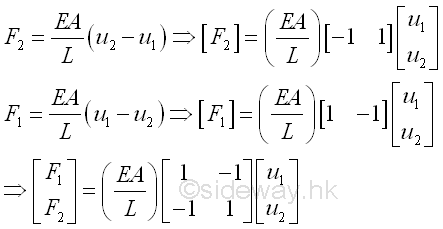 Consider a simple system with 2 elements of same material of Young's modulus E, length L and area A. 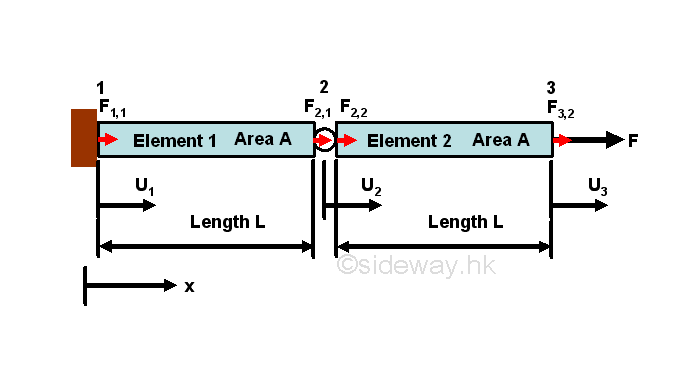 Two elements are connected by a hinge, with one end of element 1 is fixed to a wall, while one end of element 2 is under an applied load F.
The two force-displacement equations for elements are only elemental equations of the 2 element sytem. 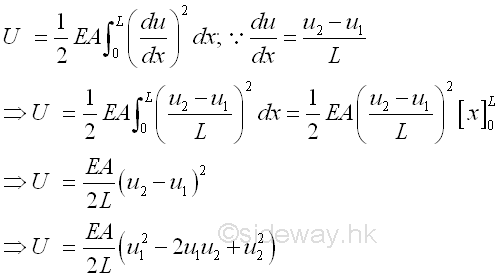 Numerically, the force-displacement equations can be combined together to form a bigger system matrix form. As node 2 is a common point for force F2,1 and F2,2, forces acting on node 2 can further be combined by assembling or grouping the two related force and displacement equations into one equation only. 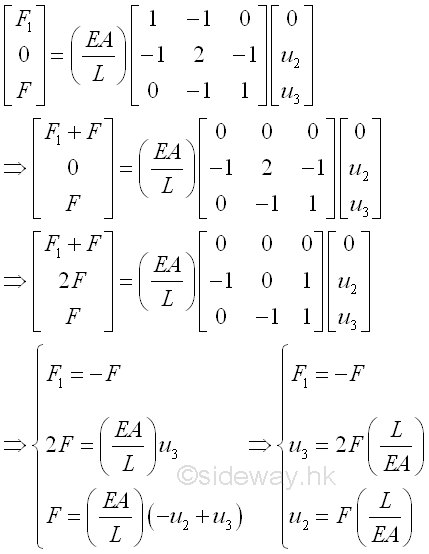 The global matrix form can be reduced to have equations for 3 nodes only. 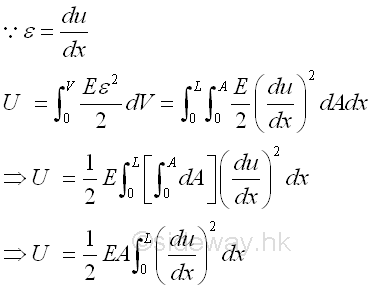 Since there are three force and displacement equations and three unknown, the force and displacement equations can solved.